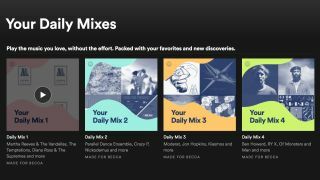 Spotify appears to have launched a new block feature for its users, allowing them to prevent certain artists and bands from playing when shuffling their Spotify library or listening to curated playlists. Select users are able to click on the "..." menu by an artist's name, and select "Don't play this artist", stopping their tracks from playing in Discover Weekly playlists, Daily Mixes, or national and global music charts. Thurrott first spotted the new feature, which has appeared on a number of seemingly random user accounts – Spotify's usual practice for trialing a new feature before it rolls it out on a larger scale. There's no official word on the feature, though, so this may be one software feature that never makes it to the wider market. Subscribers to the music streaming service have long called for a way to stop their least favorite bands popping up during otherwise joyful playlists – both to protect their ears and to stop financing artists they don't want to support. Even if it would benefit the user experience, though, there could well be pushback from artists who find themselves losing streams on popular playlists – say, if the global userbase decided to cull Ed Sheeran every time he popped up in the top singles chart.